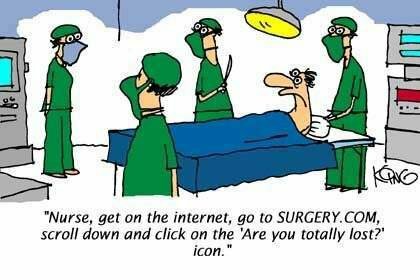 More recently, over the last couple of years we have seen how technology has been changing the way we practice and learn medicine. Now, when rounding in a hospital “everyone” has a smartphone, tablet, or netbook that gives the information in a heartbeat. Those that do not, likely can access the information from a nearby computer. All this is truly amazing but, if you were an intern once; Do you remember what was your first day like? Every medical student that is in a Residency program had to sit down countless amounts of hours in order to get there, but nothing prepared them really for that first day. That first day when you are on call and your beeper starts ringing. Dr. Butterfinger, my patient has chest pain, EKG changes and machine reads STEMI (ST Segment Elevation Myocardial Infarction). What do you want to do? From one day to another everything changed. Before this day you were the one sitting with the audience, enjoying the show. Now you are the one (in part ) making decisions that will directly impact someones life. Gulp…. And so comes the “July Effect”. The July effect is a hypothesized scenario in which changes in training hospitals occur. Medstudents becoming 1st year residents or interns, and interns becoming residents and therefore “head” of the team. Some say July is the worst time to be in the hospital some do not agree. Different studies are out there but a recent one got the eye of the News, it was a publication in the Annals of Internal Medicine : “July Effect”: Impact of the Academic Year-End Changeover on Patient Outcomes. A Systematic Review which concluded with “ Mortality increases and efficiency decreases in hospitals because of year-end changeovers, although heterogeneity in the existing literature does not permit firm conclusions”. It is an interesting read and recommend it to anyone but the point is not to discuss this, the point is what follows. What if you could practice your medical knowledge before you became an intern? Simulators out there exist but lets face it they are not very appetizing to the users. You have books, interactive tablet books, software etc with a similar mechanism as the “Choose Your own Adventure” type of books we read as kids but thats about it. Here is where Second Life a free 3D virtual world where users can socialize and connect, could have an important role in medical education. Imagine the following scenario. You read about treatments for Diabetic Ketoacidosis, Respiratory Failure, STEMI, Pulmonary Edema, Heart Failure etc you name it. Once you read about it instead of having your usual, boring and annoying test your test becomes a 3d Virtual game where you get to exercise your knowledge. Far more interactive and realistic than a couple of questions. This will stick better to your brain and you will be less likely to forget it (Use it or Lose it) So instead of having a Multiple Choice Test on the subject have a 3D Virtual Test! It’s kind of a Gamified Test! Still do not get the picture? Here take a look at the following link by Second Health which have done an amazing job. I am aware this has been present for years, which in my opinion, makes it more surprising that we have not incorporated it to a teaching setting. Yes.. Really great work man,, Please keep it.. I think it’s superb for new generation knowledge..
A Tattoo that has your Medical Record? Hey Doc, Think your twitter account got hacked.